This one is part of a pair that share a nest inside that birdhouse. Taken at Walney Pond. They take turns standing guard while one is off. Must be some young inside. The Tree Swallow, Tachycineta bicolor, is a migratory perching bird that breeds in North America and winters in Mexico, Central America and the Caribbean. This swallow is about 5 inches long and weighs less than an ounce. The bill is tiny. 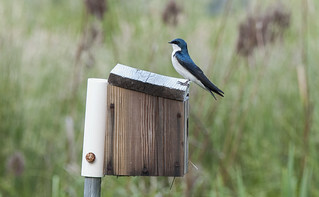 The adult Tree Swallow has an iridescent blue-green upper body, white under side, and a very slightly forked tail. The female usually has duller colors than the male, often more greenish than the more bluish male. The juvenile plumage is dull gray-brown above and may have hint of a gray breast band.